Picking out the right tires for specific applications can make or break a waste company’s fleet. A waste company may not think of tires as a critical component of its fleet, but choosing the right set and adhering to strict maintenance protocols can be just as important as other preventative maintenance practices. Despite the often-overlooked nature of the role tires play in a fleet’s operations, selecting the right tire for the right application based on tread wear, change intervals and cost savings can make or break a hauling operation. Looking at the tread is a good starting point when picking out tires for a specific application, Burroughes says. 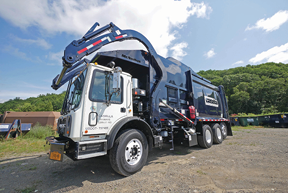 “Waste hauling operations demand a tire with deeper and wider treads in order to extend tread life in a waste collection operation,” he says. 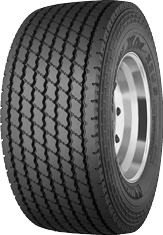 An example he provides is the 315/80R22.5 Michelin ZUS2, which is designed for long tread life in high-scrub urban applications such as those faced by waste vehicles. Additionally, Burroughes says retread products can help extend a tire’s lifespan: A tire from a refuse or waste fleet can be treated four to six times or more, depending on the casing integrity and fleet maintenance practices, whereas a tire running on a line-haul fleet may get retreaded once or twice, depending on the maintenance policy. When it comes to picking the type of tire for an application, Brian Bentley, national account program manager for the Construction Division at Trelleborg Wheel Systems, Wakefield, Massachusetts, says operators need to consider where it will be used. Hannah says determining the truck type and hauling applications the tire will be used for, such as on- and off-road capabilities for rural pickup or landfill transport, can help operators ensure their needs are met. “Bridgestone recommends fleets work with a trusted dealer partner to discuss their business needs and identify the right tire for their goals,” he says. Every fleet shop should have a master air gauge and every driver should have an accurate pressure gauge. Drivers should be instructed to check the tires on their truck every day during the pretrip inspection. A tire that is run 10 percent underinflated will lose 10 percent in tread wear and will come out of service quicker. A tire that is 20 percent below the optimal air pressure is considered a flat tire. A tire that is 20 percent underinflated will experience casing fatigue that could lead to a catastrophic failure or a zipper rupture. If the tire has been run 20 percent underinflated, it should be removed from the vehicle and scrapped. Improper air pressure, misaligned equipment and inappropriate use of a tire/retread design for an application can limit the life of a tire. Many tire problems can be traced to these mechanical conditions in the vehicle. To obtain maximized tire performance, vehicles must be properly maintained, including getting regular alignments. The dual purpose of proper alignment is to minimize wear and tear and to maximize predictable vehicle handling and driver control. Try to match tires with the same tread depths, tread patterns and height or diameter. Radial tires should be rotated when necessary. If the tires are wearing evenly, there is no need to rotate. If irregular wear becomes apparent or if the wear rate is perceptively different for drive tires and steer tires, then tires should be rotated to alleviate the condition. Older drum brake systems are challenged by the demanding start-stop application of waste vehicles and should be monitored. Excessive brake heat can lead to degradation of the bead area, reducing future retread opportunities and expediting possible tire failure. Disc brakes are rapidly replacing drum brakes in many applications, which greatly reduces the heat generation produced from constant stopping. Once the right tire has been selected, Evan Perrow, senior product marketing manager at Goodyear, Akron, Ohio, says the next step for operators is to make sure the tires are maintained properly. “Maintenance, including regular tire inflation checks and adjustments, is strongly recommended for waste haul fleets that want to optimize the performance of their tires,” he says. Perrow recommends checking for overinflation and underinflation, since both conditions can change a tire’s footprint and service life. “Underinflation can be particularly detrimental as it can contribute to premature and uneven wear,” he says. Underinflation can also cause tires to flex on the road and impair fuel economy since underinflated tires cause truck engines to work harder. “Like tires for other applications, waste haul truck tires are designed to run at specific pressures based on the load they are required to carry,” Perrow says. Hannah says dealer partners may have programs available to help operators maintain their tires. Consultations, he says, can be done through a yard check where technicians trained by the Tire Industry Association, Bowie, Maryland, assess tire conditions and determine if the retread repair process is a viable option. “This practice helps ensure fleets are getting the most out of their tire assets,” Hannah says. Industry sources say while choosing and maintaining tires for a fleet can be complex, working with a trusted dealer or partner can make the process easier. These partnerships can help ensure operators are getting the best tires for an application and are properly maintaining them. “A trusted dealer or partner will help [a customer] design a custom tire policy, keeping in mind the requirements of the fleet to maximize uptime,” Hannah says. Perrow says partnering with a dealer can also help operators understand the total tire operating cost and the role tires can play in that cost. “Some fleets consider price to be the driving factor, but we urge them to look beyond the upfront cost of a tire and instead consider how [establishing a partnership with a dealer] can help operators optimize the return on their tire investment,” he says. Engineering firm selected to help Johnson County, Kansas, develop solid waste management plan. Kansas City, Missouri-based environmental engineering firm Burns & McDonnell has been chosen by the Department of Health and Environment (DHE) of Johnson County, Kansas, to assist it in developing a solid waste management plan (SWMP). The planning will involve providing “the vision and framework to guide future activities and develop the infrastructure, programs and policies needed to manage the county's solid waste for the next 25 years,” according to the two organizations. 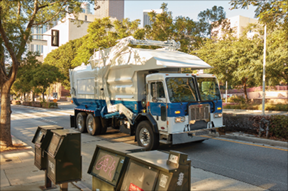 The SWMP will account for the bi-state, regional nature of solid waste management in the Kansas City area and provide options and recommendations for enhanced regional coordination to achieve shared goals, according to the DHE. providing a summary of applicable state, regional and national solid waste management trends. FOG recycling facility is expected to be operational by the end of 2018. Green Energy Biofuel says it plans to invest $4.3 million to build a fats, oils and grease (FOG) recycling facility in Warrensville, South Carolina. The planned 36,000 square foot facility is scheduled to be operational by the end of 2018. According to an announcement posted by the South Carolina Department of Commerce, Green Energy Biofuel, which was formed in 2008 with two employees, refines and recycles used cooking oil and other food products from kitchens and food manufacturers. The company services more than 1,000 restaurants, schools and recycling centers in Georgia, North Carolina, South Carolina and Tennessee. With the opening of the new plant, Green Energy Biofuels will be able to recycle more than 60 million gallons of used cooking oil and other FOG materials each year and produce 300,000 gallons of biodiesel and other recycled-content products. Chip Gingles, former director of solid waste for a North Carolina county, joins Waste Pro team. Waste Pro USA, Longwood, Florida, has appointed Chip Gingles to serve as its divisional vice president for North Carolina. He previously served as director of solid waste for Buncombe County, North Carolina. Gingles has nearly 20 years of management experience. He joined Waste Pro in 2015 as division manager of its facility in Asheville, North Carolina, where he managed 60 employees. The facility serviced more than 38,000 customers. Gingles joined Buncombe County as director of solid waste in 2017, where he gained valuable experience in the public sector and developed an understanding of the government perspective and process regarding waste and recycling services. In 2018, Gingles returned to Waste Pro as divisional vice president, overseeing Waste Pro’s operations in 14 counties across the state. In addition, he supervised 195 employees who operate 150 trucks, servicing more than 105,000 residential customers and approximately 5,000 commercial customers. Gingles initially joined the waste industry in 1998 with Republic Services, where he worked for 16 years. During that time, he fulfilled various positions, including general manager. Gingles also served as a territory manager for Sara Lee, where he further developed his sales and management skills.